When I thought of it, it was really an impossible task to bring my mother, an octogenarian, to the Abode of Supreme Peace and Love, from the distant Himalayan land of Sikkim. But no task remains impossible once His Divine Grace is showered in abundance. A comment passed by a close friend of mine is still vivid in my memory: “You should have taken your mother earlier. Now it seems to be too late for the journey because of her advanced age and ailing health and it may not be possible for her to travel. You may consider it as impossible a task as trying to fill a bamboo cane basket with water.” This in fact hurt my feelings since my dear old mother had been all the time wishing and praying to find refuge at His Lotus Feet in Prasanthi Nilayam for the last five years. Yet I did not lose heart but went on yearning and cherishing like a good optimist with all my unwavering faith in the Divine Grace of Sri Sathya Sai Baba. I had given up pessimism since the time I had come to know about Bhagawan; has HE not assured that He will not forsake those who seek refuge in HIM? Time kept on passing swiftly and my heart too kept on throbbing all the time with a worry as to how to proceed on the long journey. Yet, with a firm and steady faith, I could muster enough courage with all the patience that could be squeezed out of an ever hopeful heart. In January 1979, I got the rarest opportunity again in my life to be blessed by Bhagawan Sri Sathya Sai Baba at Brindavanam. It was a wonderful Interview. My experience at the interview reminds me all the time that even our parents cannot love and care for us so dearly and selflessly as Swami does. His Love is impartial and infinite and He is ever ready to forgive our shortcomings and mistakes. His Love is for each and every being in Creation. I prayed to the Lord with hands folded, whether it was possible for me to bring my mother for His Divine Darshan. To my relief and satisfaction, Sathya Sai Baba told me that it was possible without the least doubt and that she could travel without any fear of sickness throughout the journey. 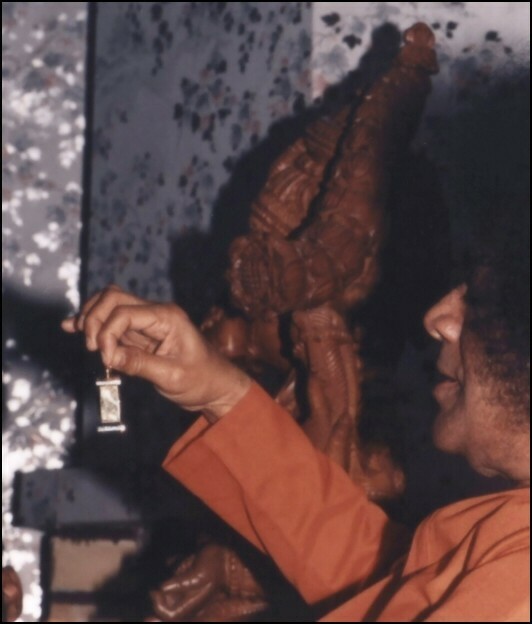 A beautiful silver locket was materialised and given to me and Sathya Sai Baba said that I should take it home very carefully to be given to my mother so that it would protect her all the time while proceeding on our journey and also throughout the rest of her life. After this great moment, I was once again back to my home in Gangtok, the capital of our Himalayan country, Sikkim, although my heart did not permit me to leave the portals of His Abode. To be candid with my views and to dwell upon the true experiences of my life, I do not have the least doubt that it is just because of Swami that I have been blessed with a new life, in pursuit of the real Destination. Dwelling on the first stage of the journey from Gangtok, I would like to share with all the fact that my mother had the vision of our Beloved Lord, who seemed to be keeping pace with the speeding jeep even when she was wide awake. This happened when we were on our way from Rangpo to Tista, the two main check posts on the route from Gangtok to Siliguri, the nearest railway station. It was late in the evening of Monday, the 31st January 1983, when He granted this vision to my mother. The effect was so miraculous that she felt very happy and quite at ease. All the time, she sat in her seat, lost in an inexplicable sea of joy. It was as though the Lord of Parthi had touched her with His Divine magic. She did not feel travel sick or fatigued even as we arrived at Siliguri in the late hours of the night. We found her still fresh, hale and hearty and the arduous journey through the twisting and winding roads had not affected her in any way. We knew that this was the most difficult part of our journey. Yet this visible sign of His care and Grace inspired us to proceed on our journey without worries and fear. After this, the journey was quite pleasant and comfortable, and we arrived at Prasanthi Nilayam, the Divine Abode of Eternal Bliss. What followed after reaching Prasanthi Nilayam can only be described as the unfolding of another chapter of how He, our Lord Sai, lives every second of the day for giving His Love to His dear and wayward children, of how He draws them to Him with all the care of a mother nursing her first born child. He granted us interviews, chiding us to crave instead, for the inner-view of our Real Self, the grandeur of the spirit, which would confer upon us the gift of Paramananda. He gave a nice and cosy room for my mother to stay in and also other gifts of His Grace. What more can a child aspire for from a mother. Even to think that the Lord cares so much for every being, even insignificant people like us, who had not been able to offer anything to HIM and had always aspired to achieve His Grace, truly unfolds volumes of His Divine Glory. Now we all feel that the bird has at last found its refuge. It has no more destinations to reach, no more vistas to explore. This is really the final `homecoming’. The sentiment of heartfelt gratitude that wells up within the deep recesses of my heart cannot be described in words and yet I feel so grateful to the Lord for all times to come for having opened my eyes from the deep slumber of ignorance to bring me to the path of Light and Truth.